The lone traveler had finally reached the edge of the desert. Six days of sand and mountains, lizards and scorpions, and a flask with never quite enough water. Like most things in life, his grueling journey through the unforgiving desert was an enormous obstacle towards a new beginning. The beautiful city he had heard so much about lay in the distance on the edge of a mountain range surrounded by forests and rivers. The towering walls shined white from the sun. Scripting invasions would probably take another few months (and they wouldn't work anyway because of the city's complex design), so I'm submitting it as an eyecandy. This map was started in January 2011 and completed in January 2014. Exactly 3 years. When I started the map, I only intended to fool around in the editor for 5 minutes, and then put the game back in my bottom drawer to never be played again. Unfortunately for me, in that short 5 minutes, I liked what I'd made and decided to continue editing... on and off for the next 3 years. It consumed way too much of my time - creating sections of the city, and constantly erasing sections and starting them again to be perfect. Tedious is an understatement. A ridiculous amount of attention went into detail. The game is too old and the community too thin. There's no reason to make such large maps anymore. It is a pity to see that this is your last map, but it wasn't unexpected. With the dying community, there doesn't seem to be much to still be here for. Your maps are great, and the attention paid to them should inspire many mapmakers to pay better attention to details and the such in their own maps. Of course, with less people taking interest in Stronghold, it's no surprise that high-quality maps such as this are not available to see in the New Files section as often anymore. All in all, thank you for your contributions over the years. 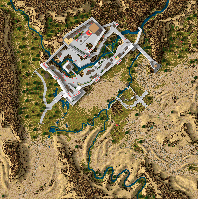 A great map, dragonheart... a real masterpiece of map making. I wish you the best for your future!